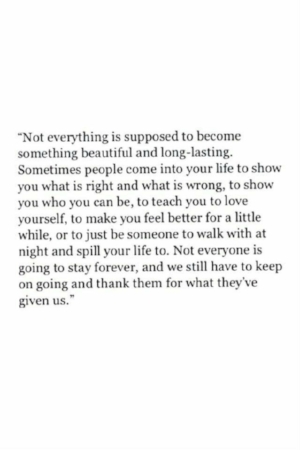 Not everyone is meant to stay. That is okay. Our ability to not attach by possessing a person is paramount in respecting ourselves and others. People can come and go like the tide, some crash in so hard that you will never forget them, others slowly roll in and stay a while. The beauty from the shore with the flow allowed to come and go is where the magic happens. Your desire for something to go a certain way in a forceful manner will never work or last. In fact, it may ruin it all together. Gratitude toward someone in your life, regardless of how it looks or the time they stay, sets you free from expectation and allows you to really enjoy them. We all have the choice to stay or to go.